Why did they put contradictory gospels together in the New Testament? The Synoptic Gospels (Matthew, Mark and Luke) and the Gospel of John contradict each other on the date of the crucifixion of Jesus. The Synoptics tell us Jesus ate the Passover sacrificial meal with his disciples the evening before he died; the Gospel of John that Jesus was crucified at the same time of the Passover sacrifice. In the Gospel of John there is no description of a ritual meal — “take, eat, this is my body, etc” — on the eve of Jesus’ arrest. Whoever was responsible for collecting those gospels with such a blatant contradiction and placing them side by side in a holy canon? What on earth were they thinking? The First Edition of the New Testament is a groundbreaking book that argues that the New Testament is not the product of a centuries-long process of development. 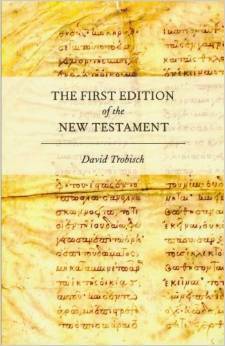 Its history, David Trobisch finds, is the history of a book — an all Greek Christian bible — published as early as the second century C.E. and intended by its editors to be read as a whole. Trobisch claims that this bible achieved wide circulation and formed the basis of all surviving manuscripts of the New Testament. and the evidence that the collection was known as the “New Testament” from the beginning. The second part of his book is another fascinating exploration, this time of the “editorial concept” of the New Testament. Trobisch alerts us to many features many of us who have grown up with the New Testament know all too well but have tended to take for granted. I am thinking of those many little cross-references and “coincidental” positions of the books in relation to one another. The NT is collated like a little code book in some ways. There is just enough information placed strategically to allow us to discern a real historic unity behind all of the books and to see who has written what and what the historical relationship of each of the authors was with one another. (I’m talking about a naive popular reading of the NT.) So towards the end of 2 Peter and 2 Timothy we find Peter and Paul writing in ways that lead us to think all their earlier differences (e.g. in Galatians) were patched over and they ended up as spiritually affectionate brothers. There are enough references here and there to Mark to alert us to identifying the apparent author of the second gospel as the companion of Peter. Similarly Luke is given enough “incidental” references for us to identify him as a beloved physician and companion of Paul and author of Luke-Acts. In a codex form it would have been a thrill to explore back and forth to see how all of the works do relate to one another, how their authors’ histories with one another can be discerned, and above all, how all the various ideas and teachings were really from the one spirit and pointed to real underlying harmony in the church from its beginnings. As we have seen, Trobisch believes the best explanation for the details of the manuscript evidence is that the New Testament as we know it was collated much earlier than generally thought. He places around the middle/latter half of the second century. Now we come to our little detail of the contradiction over the date of the crucifixion. The Asian churches observed the day on the Passover, the 14th Nisan, and claimed the apostle John as their authority. The Roman churches observed the event on the first Sunday after the full moon of that month. But both bishops were determined not to let this difference of opinion divide the church. This is consistent with the “catholicizing” theme of the New Testament. The divisions between Peter and Paul that are so stark in Paul’s letter to the Galatians are smoothed over in Acts and some of the later letters purporting to by Peter and Paul (2 Peter and 2 Timothy). Paul and Jerusalem are in harmony in the New Testament writings. Other works (not developed by Trobisch here) have suggested that the “proto-orthodox” even co-opted and repackaged Paul in an effort to steal him from the “heretics” such as the Marcionites. 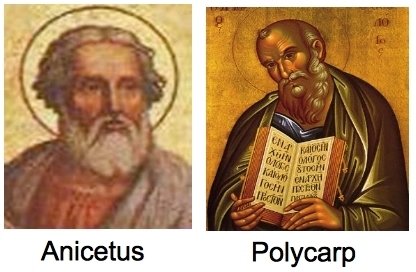 And if Anicetus and Polycarp, Rome and Smyrna (Asia Minor) could live harmoniously with different traditions for Easter then so could a holy canon for all. Posted on 2014-07-14 11:44:35 GMT+0000 by Neil Godfrey. This entry was posted in Uncategorized and tagged Gospel of John, New Testament, Polycarp, Pope Anicetus, Trobisch: First Edition New Testament. Bookmark the permalink. I’m glad you’re getting to this book, as it was one of my favourite reads a few years ago. As in, if the Gospels all survived a long time without being collected, I think they would have grown closer together. Each one would be edited over and over, being “fixed” by scribes with each copying, to bring the “facts” more in line between them. If they were collected together, and each scribe could happily find the facts they wanted somewhere in the codex (say, the correct day to celebrate Easter) they would be less likely to then change all the separate copies of individual documents. The collecting of the Gospels into a single edition put a cap on the cross-Gospel “correcting”, solidifying the different versions way earlier than otherwise. Now I’ll have to read Trobisch again to see if that was his idea or mine. I wonder why, if “many of the surviving manuscripts did not originate solo”, applies to the Gospels, how it is that subsequent Gospels could copy portions of earlier ones. Well a case may be made that Canonical GLuke and Canonical Acts did not show up on the scene until 170-180 CE or so, because of their preambles addressed to “Most Excellent Theophilus,” who could very well have been Theophilus of Antioch. Now without those preambles, I don’t think I know nearly enough to challenge the post-150 CE consensus. I’ve been wondering about this recently … why the canon seems so old. After Marcion and up until Athanasius, people would argue about the fine points of what to include in the canon, but my impression is (I am very far from an expert on this matter) that there was almost no debate about the general shape of the canon in that period. So Athanasius could hardly be seen as the innovator of the canon; it’s just that he resolved some of the details. I suppose apologists would suppose that this lends some kind of credence to the Bible. However, it seems to me that it doesn’t necessarily change anything fundamentally about how the books of the New Testament were composed originally. They were combined at an early date; but they must have circulated independently (most of them, anyway) at some point, right? Or does Trobisch dispute that? The description of the way the books are bound together by strategically placed pieces of information reminds me of Parvus’ arguments about the re-editing of the Peregrinian letters into the Ignatians: someone went to the trouble of editing one of the Polycarp’s letters as an introduction to the Ignatians and crowbarred Polycarp in as a character in the Ignatians. As I understand Trobisch he is not disputing that (many?) of the books were originally composed as independent works without thought of a canon of related works. But they were collected very early. I think he says around 120 CE. At the same time we know that Matthew, Luke and John were not really so independent of Mark. They are clearly written in response to Mark. What the implications of that are for the canon I am not sure. Brodie believes that the letters of Paul were written by a “school”. It is conceivable these were collected very early. I, too, am glad to see Trobisch’s book getting the Vridar treatment. It’s a provocative book with some bold ideas, something (as we all known only too well) that’s strongly discouraged within theological studies. Provocative ideas lead to doubt, after all, and the stifling of doubt is essential to the survival of theological studies. (as conventional scholarship has maintained) over a bunch of individual texts that had not yet been organized into a canon. I think he makes a good argument.